Two-bedroom/one full bath chalet with large indoor Jacuzzi, skylight, central A/C- heat, wood-burning fireplace, and enclosed private lighted deck. Designed with couples in mind, this charming, intimate cabin is perfect for your honeymoon, anniversaries, or other special occasions. Master bedroom features a king-size bed with pillow-top mattress, huge Jacuzzi, skylight; French doors open onto a private lighted deck, gas grill, lounge and eating facilities. Spiral stairs lead to a loft bedroom, fully furnished with supremely comfortable twin beds. Large bath downstairs is placed for utmost privacy and convenience. All towels and linens are provided. Kitchen is fully-equipped for all cooking and baking, with a separate dining area. Living room, with comfortable recliner and rocking chair, centers around a 26-foot stone wood-burning fireplace, has cable TV, DVD/VCR and stereo sound system. Entrance French doors on both sides of fireplace open from living and dining areas to a spacious front deck. 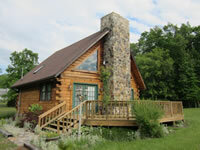 The Robin is a wonderful getaway cozy "nest," hidden away in a wooded country setting. Turn down the lights, put on your favorite music, relax and enjoy the memorable moments. Sit on the decks early morning or evening hours and watch for deer, wild turkeys and geese, West Virginia's beautiful birds-and an occasional black bear!